Amanda Malkin is the Hagop Kevorkian Fund Fellow Paper Conservator at the Freer|Sackler. This is the second in a series of blog posts that explores geometric patterns in Islamic paintings. It is clear that the complicated geometric patterns I have observed in many manuscript paintings have, at their core, the circle and the square. During my research into the tools and techniques of manuscript painters, I uncovered two schools of thought regarding the working processes and specific methods used to create these miniscule, complex patterns. 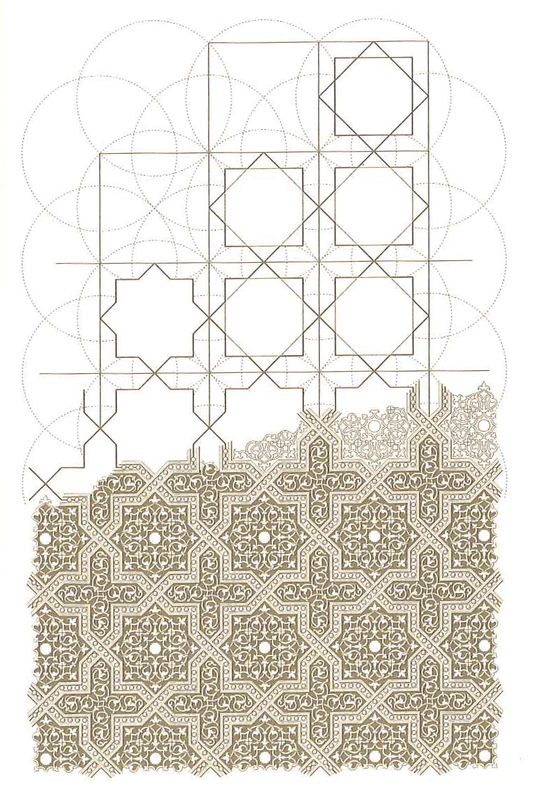 The first theory—and my initial assumption—is that Islamic artisans and craftsmen utilized the long-appreciated ruler and compass to create geometric patterns, which are known as girih. It is exciting to see that, by overlapping certain shapes and connecting those shapes with the straight line of a ruler, one can produce endless geometric constructions. This theory, known as strapwork, is accepted by many scholars and institutions that collect and study Islamic art. It is possible, however, that another method of construction was utilized in ancient Islam, and this is the second, more recent hypothesis. Physicists Peter J. Lu and Paul J. Steinhardt, of Harvard and Princeton Universities, respectively, proposed that, by using a group of five tiles of varying shapes, artisans could more quickly and exactly construct extremely complex geometric designs. These tiles are called Girih tiles, and they are described by the physicists as “equilateral polygons decorated with lines.” The shapes of the polygons are not random but stem from the empty spaces observed within the basic patterns of circles and squares. When you observe, for example, repeated hexagons, you will see that there are additional shapes created between them. Steinhardt and Lu’s theory is based on the existence of a late fifteenth-century object in the collection of the Topkapi Palace Museum in Istanbul, Turkey, known as the Topkapi Scroll. The scroll was discovered in 1986 and contains drawings and pattern constructions using the five Girih tiles, likely used as a reference document in a craftsman’s workshop during the Timurid dynasty. In light of the exciting evidence discovered on the Topkapi Scroll, I believe that both methods described above were likely utilized by illustrators in different regions and with varying skill levels, in order to assist them in the manner that best suited their work. View Peter Lu’s animation of the Topkapi Scroll. Stayed tuned for Amanda’s third—and final—post in the series.